Pimento Cheese – a quintessential of Southern food; primarily a blend of sharp cheddar cheese, mayonnaise and sweet spicy pimento peppers. Creamy, slightly sweet and slightly sharp. An addictive appetizer that perfectly goes with crackers, veggies, sandwiches and burgers! PLUS 27 other scrumptious recipes to try for every day of February as we celebrate Black History Month. At first, I honestly don’t understand why people (especially the Southerners) go gaga over this bright orange creamy spread. But during my last trip to South Carolina, I finally got the courage to “taste test” my sister’s homemade Pimento Cheese. And boy, I didn’t notice I was already spreading my crackers and sandwich with it as the day goes by. Now I know why it’s a staple down South! Until I eventually asked the recipe from her so I can make it back home. Pimento peppers are bright red heart-shaped or round-ish sweet peppers that are usually 3-4 inches long and 2-3 inches wide. Among the pepper family, these ones register the lowest heat. Instead, they are very mild and sweet in flavor. It can add a sweet pepper flavor to your dishes like those of red bell peppers. They are frequently sold in cans or jars in most grocery stores and usually displayed along the olives counter as they are commonly used as stuffing in green olives. 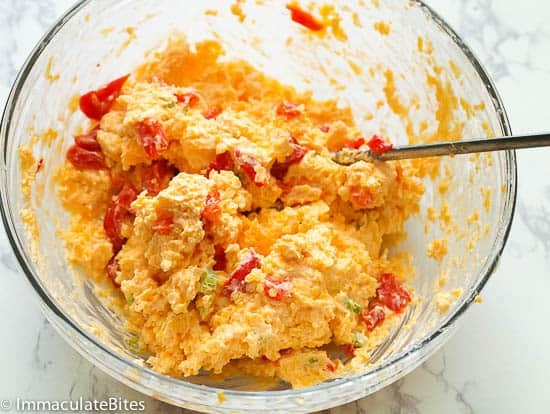 Depending on where you’re from, pimento cheese are also called pimenna or mento cheese. It is named for the Spanish word pepper: pimiento (or pimento) which is one of the highlights of this recipe. 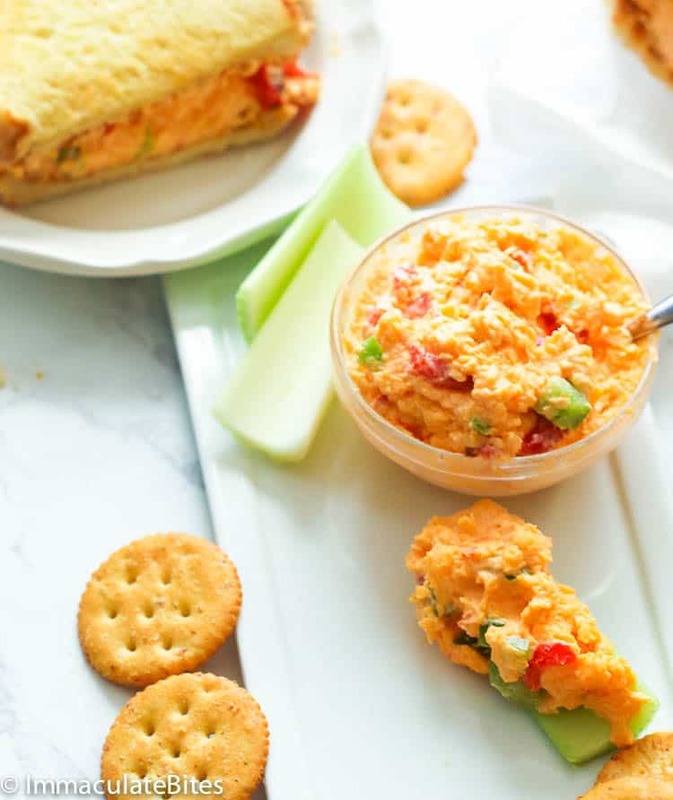 Pimiento cheese is a lovely blend of sharp cheddar, sweet-spicy pimento peppers and mayo. 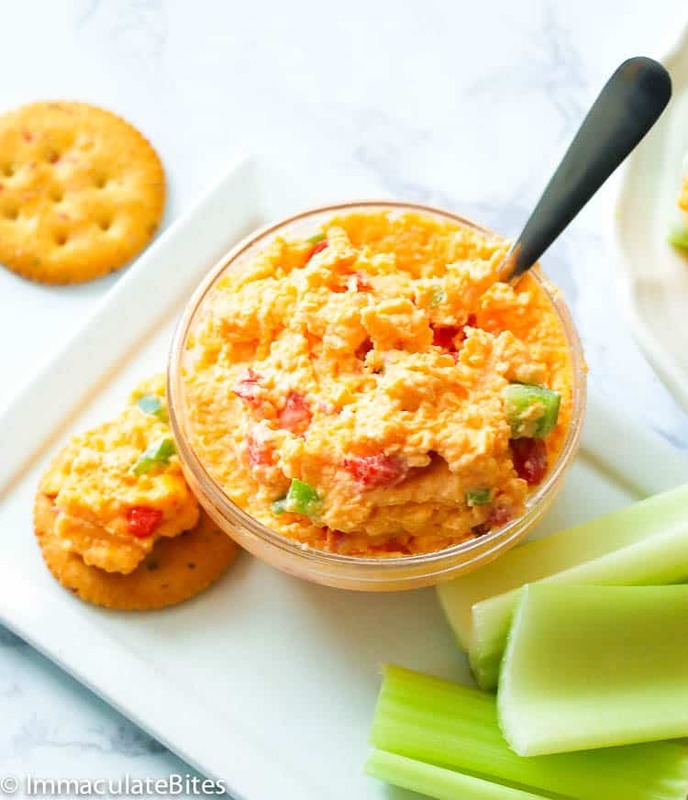 It’s creamy, slightly sweet and sharp spread and has been well-loved in the Southern part of the U.S.
Pimento cheese is best served as dips for crackers and veggies and as a sandwich spread. They’re perfect for summer time parties, tailgating and game days! How to make pimento cheese? It’s too easy to make this popular Southern dip/spread. You can even make it with eyes closed. 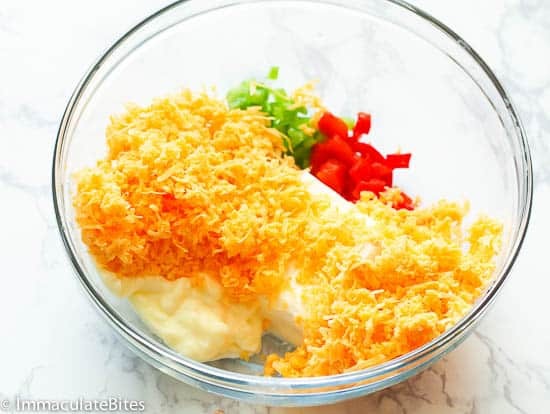 😉 To start with, you have to soften first the cream cheese to a room temperature before add it in a bowl with shredded cheddar cheese, mayonnaise, garlic and onion powder and cayenne pepper. Mix all of those by hand or with a mixer; I prefer using a mixer to ensure they are thoroughly combined. Then you gradually fold in the diced pimentos and jalapeno pepper and season with salt and pepper. Allow it to sit in the fridge at least an hour or overnight before serving. How long does pimento cheese last? 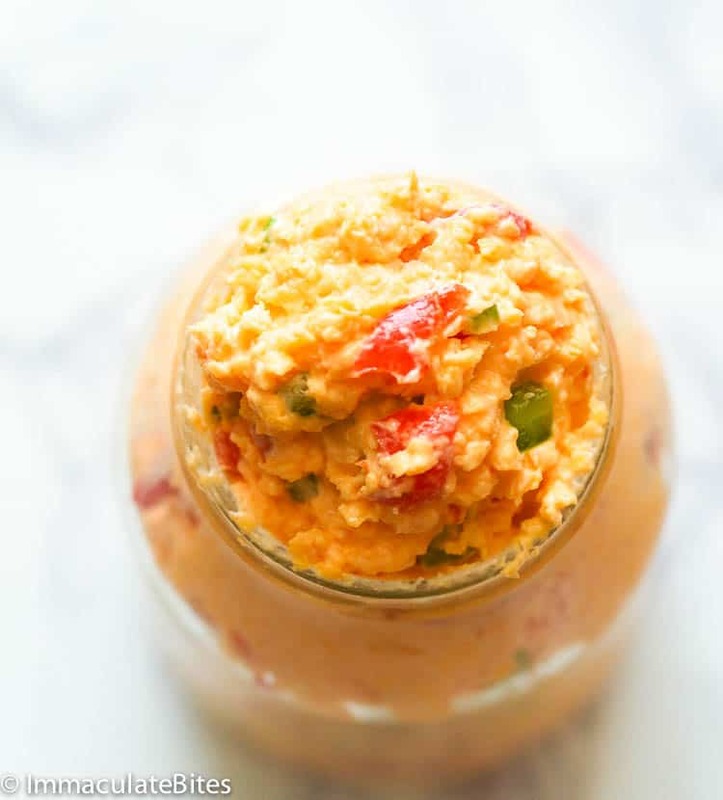 Since there are lesser preservatives in this homemade pimento cheese compared to jarred store-bought ones, you can store it in the fridge in an airtight container for about a week. As much as we love to freeze and save almost anything in our kitchen, this one here is beyond our power. The ingredients in a pimento cheese don’t freeze well. The oils from cheddar and mayo separates as it is thawed and the cheddar cheese becomes spongy, but the flavor is there partially. But it won’t look as appetizing at it was when freshly made. You can now spread them on crackers, burgers, sandwiches OR make it as a dip for crackers, chips, tortillas, veggies like celery and peppers. If you have the luxury of time, you can take the pimento cheese sandwich up a notch and turn it into a Grilled Pimento Cheese Sandwich. What a treat!! My son did love it! 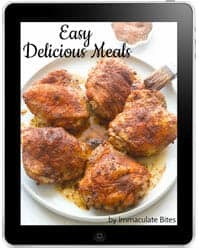 So if you’re planning a game day menu, make sure to include this one here in your list. Aaand keep scrolling down to feast on other scrumptious dishes from fellow black food bloggers as we celebrate Black History Month through rich and soulful flavors of black cuisine across the world. If you can only find the whole jarred pimentos, just diced it up yourself with a knife or food chopper. I go by with Philadelphia cream cheese, if you’d ask. Make sure to soften it so it’ll combine well. Add more mayonnaise if you want a thinner consistency. Adjust taste to your preference. Pimento Cheese - a quintessential of Southern food; primarily a blend of sharp cheddar cheese, mayonnaise and sweet spicy pimento peppers. Creamy, slightly sweet and slightly sharp. An addictive appetizer that perfectly goes with crackers, veggies, sandwiches and burgers! Bring cream cheese to room temperature before proceeding. Then add cream cheese, cheddar and gouda cheese , mayonnaise, garlic, onion powder , cayenne pepper , jalapeños , pimentos and hot sauce to a large bowl. Thoroughly mix - use mixer, if possible, this with ensure that the mixture is fully combined. if desired. Season to taste with salt and black pepper. Bring cream cheese to room temperature before proceeding. Then add cream cheese, cheddar and gouda cheese , mayonnaise, garlic, onion powder , cayenne pepper , jalapeños , pimentos and hot sauce to a large bowl. Thoroughly mix – use mixer, if possible, this with ensure that the mixture is fully combined. If desired, season to taste with salt and black pepper. Bourbon + sweet potato pie | Eat.Drink.Frolic. 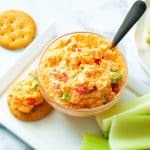 I have tried many recipes for pimento cheese, searching for my go-to recipe. FOUND IT!!. I made followed your pimento cheese recipe – including the jalapeño – and it was just fabulous! Everyone who as tried it has raved about it! Many thanks to you for sharing. Do you use both the cheddar and Gouda cheese? Yes, I do. Gouda cheese is one of my favorites – really enjoy it in this recipe .Alternatively you can only use cheddar cheese . Smoked Gouda, my favorite, would be great. Thanks for the recipe. I enjoy your website. You give all the details about the product. 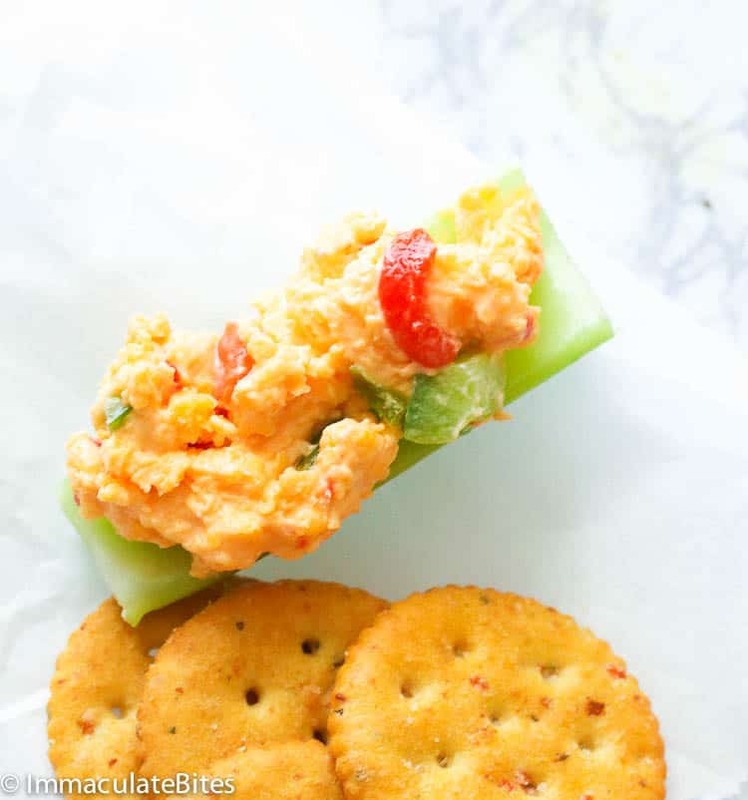 I never knew you could make pimento cheese spread homemade. I always bought it in the store. Your recipes are superglossal! Thank you so much. Yum, brings back memories of my trips down South, must try this soon. On your #4 directions, you start with an incomplete sentence. I wonder if something go let out.